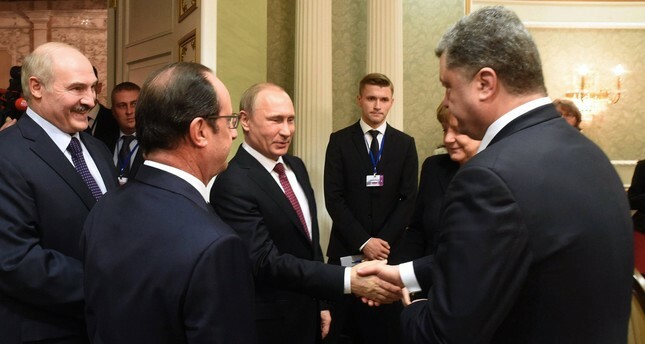 Russian President Vladimir Putin with Ukrainian President Petro Poroshenko in a meeting on Feb. 11, 2015, in Minsk. Ankara is enjoying boosted relations and advancing collaboration in different fields with its northern neighbors, Ukraine and Russia, despite the ongoing political dispute and border frictions between the two post-Soviet nations. While Ankara has recently been focusing on collaboration with Ukraine in the military industry, cooperation with Russia is mainly grounded in economy as well as massive projects, including the Akkuyu Nuclear Plant and TurkStream, whereas tourism holds a crucial place in Turkey's ties with both countries. Turan Oğuz, a defense industry researcher told Daily Sabah that despite the fact that common military projects have not materialized much yet except a passive radar system and research-development activities, Turkey and Ukraine have lots to do jointly, since they have symbiotic relations in the military industry. "Due to its Soviet past, the Ukrainian military-industrial complex has great technological knowledge in ballistic missiles, tank and battleship engines and military radars – namely the things that Turkey needs. On the other hand, Kiev is on a course for NATO membership, and is learning the bloc's military systems from Ankara. Apart from that, Turkey has a good place in electronics, communications and algorithms in the military industry," Oğuz said. On the other hand, Ankara's relations with Moscow, Kiev's main foe in the region, have also been evolving on a sound basis due to cooperation in a wide range of fields, including economy, joint industrial projects and militarily, with Ankara's possible purchase of the S-400 defense system. However, issues such as the situation in Crimea remain a stalemate in the three-way relations. "Turkey is trying to keep its ties with both Kiev and Moscow in balance and has successfully achieved so far. But this fragile three-way relation has some nerve-endings that should not be triggered," Eşref Yalınkılıçlı, a Eurasia analyst and journalist at TRT World, told Daily Sabah. He pointed to the situation in Crimea and the Tatars as one of those "nerve-endings." The Crimean peninsula was annexed by Russia after an independence vote in 2014, following the ousting of President Viktor Yanukovych as a result of pro-EU Euromaidan protests. The U.N. General Assembly later voted to proclaim the Russian action illegal and along with an overwhelming majority of U.N. member nations, Turkey does not recognize Crimea as Russian territory either. Yalınkılıçlı said that despite President's Erdoğan special request from Russian President Vladimir Putin and the strong personal diplomacy between the two leaders, the region's Tatar minority has complained of repression, including arbitrary arrests and detentions since annexation. "Not only Tatars, but other Turkic minorities like the Meskhetians also migrated to different countries following the annexation of Crimea. It seems a handicap for relations," he contended, adding that EU countries are provoking Turkic minorities in Ukraine by using the close relationship between Turkey and Russia. Despite such strained subjects in the trilateral relations, Turkey has been continuing to strengthen ties through new agreements with both countries. As a result of the military agreement signed between Turkey and Ukraine in December 2016, Turkey will grant $3 million to Ukraine annually for next five years to buy weapons from itself. The money will be transferred to the Ukrainian Armed Forces and will only be available for the purchase of domestically-made military products from Turkey. The developing ties are not limited to this alone. A deal between Turkey and Ukraine allowing the two countries' citizens to travel to and from each other's country without passports, became effective in early June. Ukraine's Ambassador to Turkey Andrii Sybiha told Daily Sabah in an interview in April that more than 1 million Ukrainian tourists visited Turkey last year. This number is expected to rise 50 percent in 2017. He added that the trade volume, which is at about $4 billion, has much greater potential. In the meantime, Ankara and Moscow, backing different warring sides in the Syrian civil war, initiated the Astana talks along with Iran as part of an effort to find a permanent solution for the long-running conflict. The fifth meeting has been held in the Kazakh capital, where the Assad regime and opposition came to sit around the same table for the first time since beginning of the war. Recently, the two countries are also on the verge of completing the S-400 deal. The agreement is regarded as "extraordinary" by many political analysts, considering Turkey's position as the second strongest military power in NATO and the bloc's recently delicate situation with Russia. In addition to this, the jet crisis that occurred in November 2015 is thought to lead to strained bilateral relations. Fuad Safarov, an independent journalist who covers Turkey-Russia relations, said the quick recovery after the jet crisis proved that both countries did not want the exacerbation of the ties. "According to Russian experts, the S-400 deal will bring Turkey closer to Russia. We can already say that they have a military collaboration in Syria and are trying to solve sensitive issues through joint initiatives. While ties with Western countries are strained, the convergence between Ankara and Moscow is inevitable. I do not believe there are fragile points. The countries should focus on projects worth billions instead of issues like 'tomatoes,'" he said. Oğuz contended that diversifying options in the military industry is always technically in favor of Turkey. "There are three main sources of military imports: The U.S., China and Russia. Developing joint projects and diversifying options benefit Turkey, since the country may find a chance to export those jointly-developed weapons to third party countries. In fact, Turkey has already started to do so," he said.